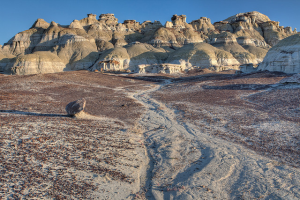 A dry river located in the Bisti/De-Na-Zin area of the Navajo Reservation in northwestern New Mexico. Although the exact location and the name of the wash could not be verified, it is safe to assume that the Nagasi Wash is located near the Nageezi trading post, north of the Chaco Culture National Historical Park. "A dry wash in the Bisti-De-Na-Zin Wilderness, New Mexico, March 15, 2015" by Bob Wick, BLM is licensed under CC BY.